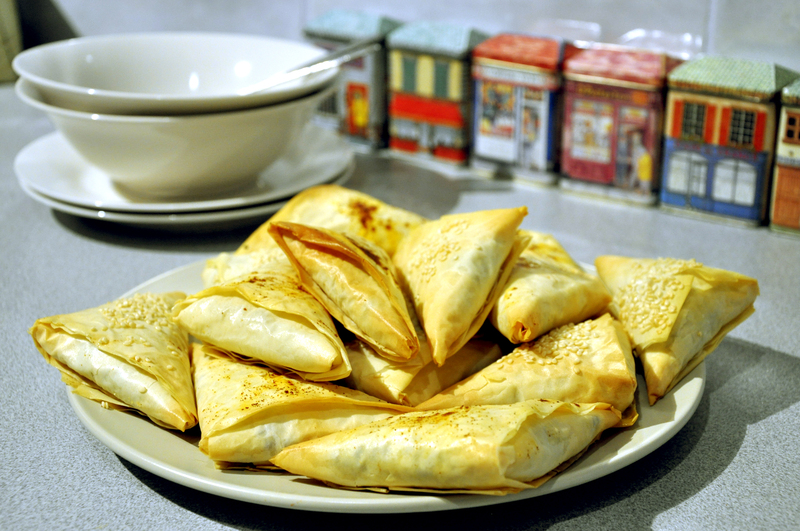 Greek style spinach triangles made with added feta and/or ricotta cheese were a popular finger food when I was cooking for functions in the 1990s, a tasty vegetarian menu option for those can’t resist the crunch of buttery pastry. After travelling in Turkey, curiosity about Middle Eastern home style cooking led me to a small book crammed with interesting recipes, “Tamarind & Saffron” by Claudia Roden who devotes a whole section to savoury fillings to encase in filo, inspiration for both this lamb recipe and the Spiced Chard Triangles. Lay the filo on the worktop and cover with a piece of plastic wrap and a dampened cloth. Remove only one sheet at a time. Melt the butter and add the oil. Brush a sheet of pastry with butter or oil and fold lengthways into three. Place a generous teaspoon full of spinach mixture at the left had corner then fold the pastry into triangle shape along the length. Seal the end of the triangle with a dab of butter or oil. Continue like this until the filling mixture is used. Brush the tops with butter or oil, dust with paprika and bake until puffed and golden, about 10 minutes. Uncooked triangles can be frozen to bake at a later date directly from the freezer. This entry was posted on June 13, 2012 by ladyredspecs in Food, Lamb, Light Savoury Dishes, Main Meals and tagged filo pastry, lamb, spices.